Corporate Membership was added to the packages on March 1, 2016. As Corporate members your organization and employees will have the opportunity to participate in the preservation of the history of the Town of Milton and surrounding area, as well as learning more about the origins of our Town. Find out more about Corporate Membership benefits! We are pleased to provide volunteer opportunities to match your employees' unique talents, skills and abilities. Your company information will be added to our web site (Corporate Membership List) and to our quarterly newsletter. 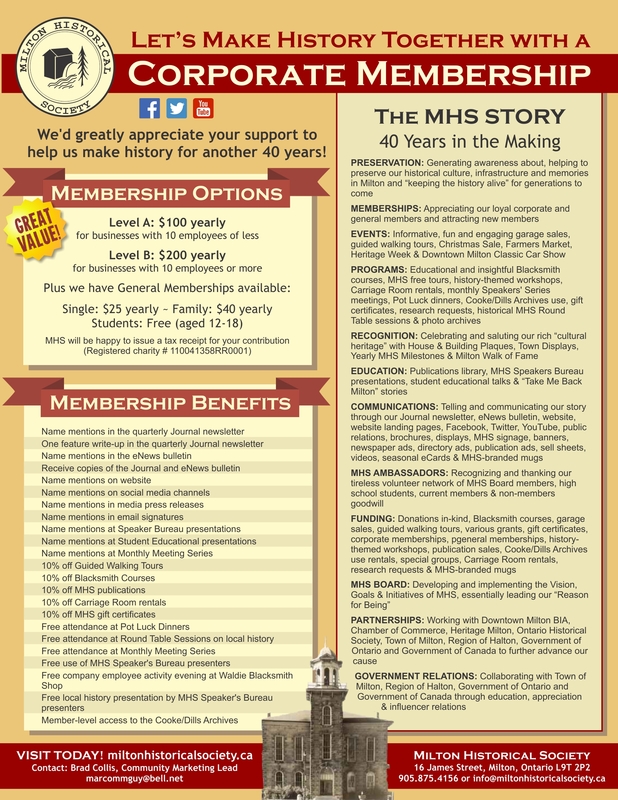 If you have sufficient information and wish to have your membership processed, please complete the attached membership form and forward along with your cheque along with your company contact information to the Milton Historical Society, 16 James Street, Milton, Ont. L9T 2P4.